Gorgeous 2 colored fancy flowers. Mild taste with a hint of tartness. Their small size makes them perfect for decorating mini desserts, drinks and passed hors d'oeuvre platters. Add vibrant colors to salads. Very versatile. 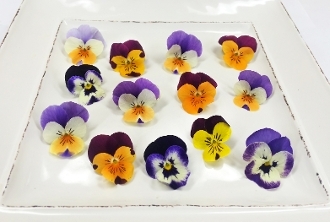 Small versions of Pansies, About 2" in length.